The last two weeks have been very rough ones for me. Losing a father is so very hard. Throughout this sad time my sweet husband has been by my side and by my mother's too. So as a small but heartfelt thank you to him, I set up a romantic table this evening. I set it up on our deck. Flowers, candles and vintage touches. Champagne chilling in a vintage silver ice bucket that once belonged to my in-laws. Spinach dip on garlic cheese toast on a silver vintage tray that once belonged to my Grandmother. Edible flowers strewn on the tray and across the vintage bridge cloth. Vintage plates and vintage cocktail napkins. Chairs filled with cozy pillows in vintage fabrics. Thank you for coming to visit me for a glimpse of my Vintage Romantic Evening. I think that I hear David calling now, so I'll have to leave you. Until we meet again please visit Suzanne The Colorado Lady for Vintage Thingie Thursday and Susan at Between Naps on the Porch for Tablescape Thursday. Bentley, go run to the door and greet your Daddy!! After weeks of rain and cool temps, summer has finally arrived. On Monday it was 102!! How about a dip in the pool?? Of course it's a red swimming pool, because it's Rednesday. Don't forget your raft!! Stay cool this Rednesday and swim on over to Sue's It's a Very Cherry World for some more fun with reds! Yes Bentley, I know the holiday weekend is coming up and we better get your own swimming pool ready!! I love quilts. My mother-in-law loves them too. Shortly after my husband and I were married she made this lovely mini quilt for me. It is patterned after an Amish quilt that she once saw. I love the bold colors and it's truly a work of art. There is one intentional flaw in the quilt. She told me that Amish women intentionally place one flaw in their quilts because they believe that only God is perfect. Flaw or no flaw, this little quilt is a perfect treasure to me. Please stop by and visit Marty's perfectly wonderful blog A Stroll Thru Life for Table Top Tuesday. Speaking of perfection ... little Bentley is napping close by as I post. To me he is absolute perfection!! Pillows ... love, love, love them!! They are everywhere in the cottage. You will find them in old rocking chairs, on the sofa, on the bed. Since there is quite a lot of blue in the cottage, you'll find lots of blue pillows too. Many of them have pink flowers on a blue background ... like these. There are vintage ones, new ones and needlepoint pillows too. My sweet hubby puts up with my pillow addiction, but I know he doesn't understand it. Ah well ... viva la difference!! Thank you for visiting me today and be sure to stop by and visit Smiling Sally for her Blue Monday party!! What's that Bentley? You don't understand why we have so many pillows either, but you like all the quilts!! Thank you to everyone who was so kind to comment on my blog and to those who emailed me regarding the death of my Daddy. All of your kind words helped to ease my pain. I am comforted knowing that he is no longer suffering and that he is at peace. I have a few random pinks to show today for this Pink Saturday. Gentle and sweet pinks reflecting my mood. I love cottage style because it is so warm and cozy. The world around us may be filled with sorrow and turmoil, but a cottage reflects all of the comfort and safety of home. Pots of pink petunias, wild roses under an old tree. Vintage dishes decorated with dusty roses on a soft pink hutch. Treasured items that are faded and sweet. A tiny stool covered in a pink floral fabric edged with some pink tassels. A sweet little vintage plate covered with tiny pink flowers. Lovely pink perennials that suddenly appear each spring. Cottage comforts. A place where we call home. Thank you again. I have met so many lovely bloggers who have made these last few months much sunnier for me. God Bless you all. Now please visit our friend Beverly at How Sweet the Sound for Pink Saturday!! Come along now dear Bentley. You are such a comfort to me. As many of you know, my Daddy died this past Friday. In honor of him I'm going to lead you down the path to the house where Daddy designed a sun room for my Mom. We'll just walk down the path along the pond and head toward the big willow tree. There is Mom's house in the distance and on the back of that house is the sun room that Daddy designed and my husband built from his plans. Daddy was both a business man and later a college professor, but in his heart, he was an architect. When Mom and Daddy moved to Idaho to be close to us they found this spot on a pond and Mom made Daddy promise to build her a sun room or she would not move. So he did. Lets go inside. Look, here's Bentley. He's comfy in a wicker chair. Grandma does have a way of spoiling him!! Daddy designed a cathedral ceiling with lots of windows to take advantage of the big willow tree just outside at the edge of the pond. No matter what the season, it's always so pleasant to sit in here and see the trees and the pond and folks walking along the path, or little boys and girls with their nets trying to catch tadpoles and frogs. There are lots of ducks and geese and Mom always keeps a sack full of dried corn handy to feed them. It really helped to keep Daddy amused and the ducks and geese would run up to meet him and he hand fed them as often as he could. It's easy to take a nap in the wicker rocker just like Bentley is doing now. A mini pergola that my husband built for Daddy where we hung a porch swing. Daddy and Mom spent many happy hours sitting side by side on this swing. I'm happy knowing that this swing brought him so much pleasure. Thank you for coming to visit Daddy's sun room and for sharing in my tribute to him. Thank you Rhondi for the opportunity to participate in your Porch Party. Come on Bentley, time to go home. At 2 am this morning, my Daddy passed away. I went to see him last evening and I feared it would be the last time. He was a wonderful father to me and husband to my Mom. I want to thank Rosemary at Content in a Cottage and Robin at Decorating Tennis Girl for the two Sunshine Awards they sent me yesterday. Please excuse me for not passing those awards along just yet. I will be away from my blog for a bit. Thank you to all of you who come to visit me. This blog has been a safe place for me. A place where I could come each day to feel more cheerful. My Daddy suffered from Alzheimer's for several years. They have been very difficult years for both my Mom and I. Thank you for befriending me and for giving each day a bit of sunshine. Vintage Kitsch Fun! And an Award Too! 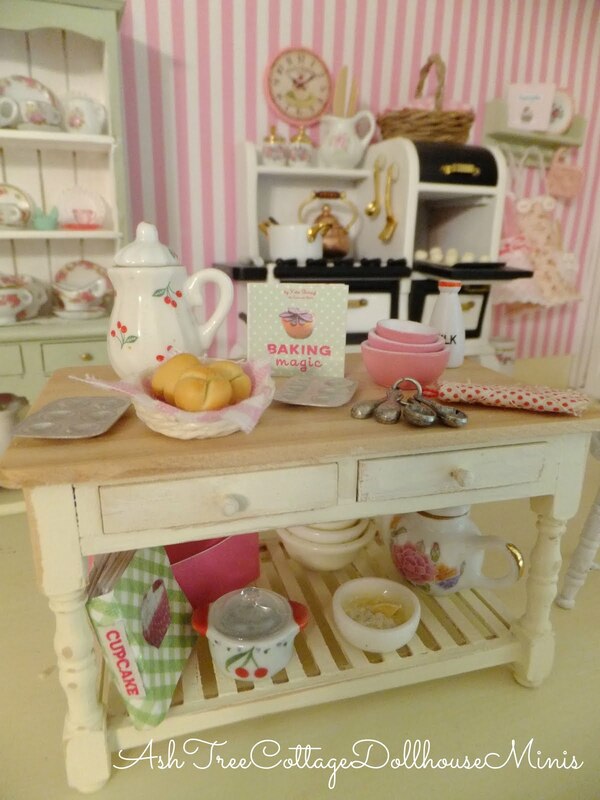 Let's put on a pot of coffee, kick back and have a bit of vintage kitchen kitsch fun! I'm a huge fan of I Love Lucy, so when I saw this coffee pot at a yard sale I had to buy it. Lucy had one like it. Speaking of Lucy, do you remember the episode where Lucy and Ricky were late arriving for dinner at the owner of the Tropicana's apartment? Lucy was so hungry that she picked up an apple from a fruit bowl on the coffee table and it wasn't until she bit into it that she realized it was wax!! So here's a vintage bowl of fruit for you, but don't eat it any!! It's fake!! Vintage kitsch goes from kitchen to patio. Let's mix up some marinade in a vintage carafe and give Daddy-O a chance to show off his grilling talent! How about some vintage Salty and Peppy shakers. They are just too cute!! I love these little vintage measuring spoons and the Fiesta pitcher too. Brightly colored measuring cups and a cute vintage spoon rest too! Thank you so much for visiting me today and for giving me a chance to show off some kitsch. Please stop by to visit Suzanne at Colorado Lady for more vintage fun! I also want to thank my dear friend Rosemary for sending me the Sunshine Award! Rosemary has the most interesting, fun and informative blog! Rosemary's blog is Content in a Cottage. Please stop by and visit this dear friend of mine and her faithful companion Webster. If we didn't live so far apart, Bentley and Webster would be playing outside together right now! What's that Bentley? I know you want to play with Webster right now, but New Jersey is far away from Idaho. We'll have to set up a play date in advance!! The temperature has dropped, the sky is gray and rain is in the forecast. Nothing like a hot bowl of soup to warm up your tummy on a cool and rainy day, especially if it's in tomato red! Let's add some fresh milk to make the tomato soup extra creamy. I'll just scrape the sides of the can with this red spatula. I love that we have a local dairy that puts their milk in glass bottles! Put that hot tomato soup in a thermos and add it to the red oil cloth lunch bag, or serve it in a bowl on top a red crocheted pot holder. Either way, it brings some warm red into the day! Sue always has sunny weather because It's A Very Cherry World over at her cottage. Be sure to pay her a visit. What's that Bentley? Another health tip? Tomatoes have lycopene. I thought you stayed in the pink by eating Wee Bits from a pink bag, but you need tomatoes too?? It's a beautiful morning at the cottage and the start of a very busy day. The birds are singing, the squirrels are chasing each other up and down the trees and the chickens next door are scratching. Last year we lost one of our walnut trees to a beetle. We were sad to see it go, but my husband decided to put the top of a bird bath on the remaining stump. I wasn't too crazy about it at first, but both the birds and squirrels love it, so here it stays. It's our Tweet Tweet Table Top. Fly on over to Marty's to see what's on her Table Top for this Tuesday. Bentley and I wish you all a very happy and sunny day!! I admire Mary Engelbreit. She created a little empire for herself by staying true to her ideas and her artistic pursuits. I am joining Vicki the "Cherry Chick" for a new Monday party in honor of ME. This is a print of Mary's that I have kept on my desk for quite a few years. I agree with Mary's sentiment. Never assume that you are too old to pursue your dreams or goals. I believe that it's not what you have tried and failed that you regret, but what you never tried because of fear of failure. Bentley never gives up on his goals. He's totally focused on what he wants to achieve. That's a good lesson for us all, right Bentley?? Bentley's Tips To Keep You in the Pink!! What helps give Bentley the energy to play hard all day chasing squirrels, playing with his toys and keeping the cottage safe?? Let's ask him ... Bentley what keeps you "in the pink"? Bentley says, " Its my Just a Wee Bit dog food in the pink bag. It's made from yummy bison and it gives me lots of energy to run and play hard every day!!" "I think mom gives me vitamins too." Okay thanks Bentley. So there you have it. Bentley stays in the pink by getting good nutrition from a pink bag of dog food. Okay Bentley, that's a wrap. You can go back to playing with your "mini me"! Now let's see what keeps the other bloggers in the pink at Beverly's Pink Saturday!! Before Agatha Christie and Dorothy Sayers. Before Aunt Dimity and Agatha Raisin, there was Nancy Drew. When I was a young girl, I loved Nancy Drew and wanted to be just like her. Of course, I also wanted to be a ballerina, a cowgirl and an architect. Here it is, a real treasure of mine. My Nancy Drew Mystery Game! The Secret in the Old Attic, Red Gate Farm, The Sign of the Twisted Candles! Wow do those titles bring back memories. My friend Caroline and I used to ride our bikes to the library and check out book after book. Oh look, here's an old flashlight to shine a light on those great memories! Suzanne, The Colorado Lady to investigate the other Vintage Thingies! Don't worry Bentley. You can take turns sitting in our laps. Maybe we will bake you some peanut butter doggie treats too!! Behind our 1913 cottage is a garage with a potting shed attached. The door to the garage is red and the shutters on the potting shed window are red too. Ivy grows up the walls of the potting shed. It gets so thick that I have to trim it away from the french door that opens into the shed. In a later post I will be showing more of the shed including the interior and the old potters bench. Until then, please stop by and visit Sue at It's a Very Cherry World for Rednesday and another Susan's Outdoor Wednesday at A Southern Day Dreamer. Thanks for stopping by to visit us today. Say goodbye Bentley! Woof woof!! Good Morning! The sun is shining this morning and what a beautiful morning it is!! Would you care to join me on the porch for a cup of tea? Bentley is here somewhere. He may just be peeking through the fence to see the neighbor's chickens. Make yourself comfy. You can choose between the antique wicker chair or Grandma's old rocker. I have been looking through this vintage garden book while waiting for you. Mornings like this inspire me to start so many projects that have been put off because of all the rain we have had recently. There is nothing like a cup of tea to get my morning started off just right. While I am busy making a list of all the things I want to do today, stop by and visit my friends who are serving tea and showing off their table tops. Take A Stroll Thru Life at Marty's and Terri is having Tea Cup Tuesday over at Artful Affirmations. Terri has been to Paris recently and has some fabulous pictures of her trip. Make sure to visit Martha at Martha's Favorites too. Martha and Terri are co-hostesses for Tea Cup Tuesday. Then stops by Wanda Lee's The Plumed Pen for Tuesday Tea for Two. Thanks for stopping by to visit me this morning. Sorry Bentley was not here to greet you. He is so very busy in the morning chasing squirrels and visiting the chickens next door. 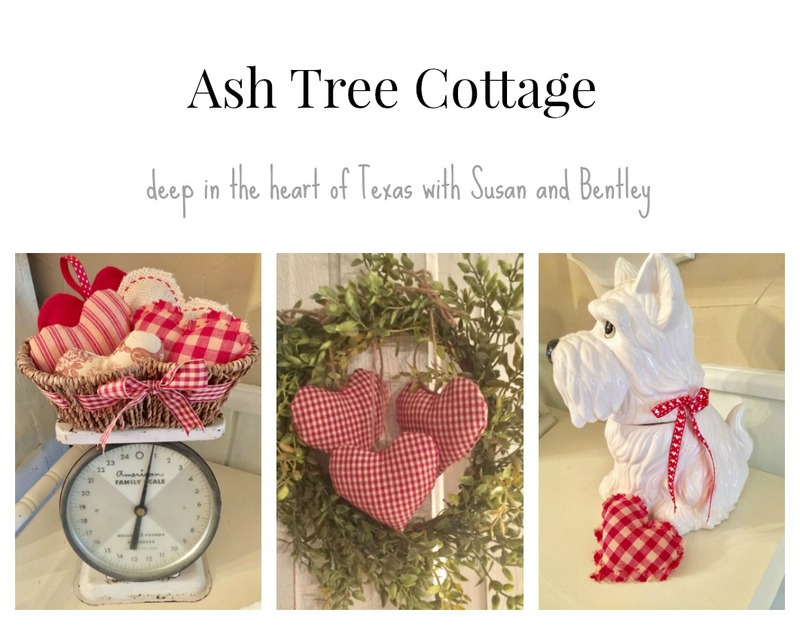 While it has still been raining quite a bit, we are keeping a sunny attitude at Ash Tree Cottage. So, in between the raindrops, I am showing you our "higgledy piggledy" garden off the back porch. It is surrounded by herbs, perennials and some annuals thrown in for color. Everything is truly just happy and living in harmony. There are miniature twig chairs and shabby chic planters. There are annuals still waiting to be planted. There are perennials opening up in front of daisies and feverfew that just grows wild around the cottage. Oh and look ... down a flagstone path are snowball bushes surrounding a little stone bench. Their branches are heavy from so much rain. The rain and wind has knocked off their tiny petals of white. Well thats our brief tour of the little higgledy piggledy garden just off the back porch. Let's hope the sun will shine a bit again soon. Bentley, lets hurry inside, looks like more rain!! Rain and More Rain in the Garden! !